The hospital is housed in two large buildings – one is 6 storied and other is 6 storied. The 12-storied building accommodates the medical college, while the 6 storied building is for outpatient services, intensive care unit and modem super-specialized cardiac centre. The indoor and outdoor facilities go a long way in meeting the ever-increasing demand of the patients. 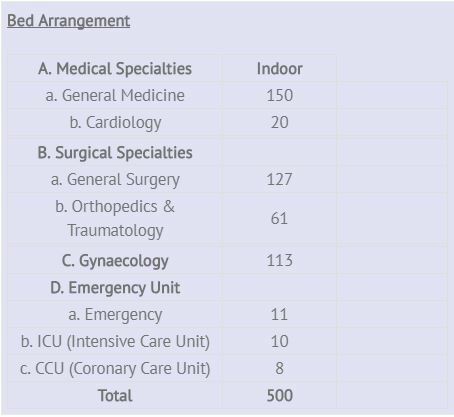 The in-patient departments have a total of 500 beds of which over 30 (number is flexible) are free.